There is enough remaining coal to further foul the air and water, but not enough coal to power additional exponential growth on a round, finite planet. Coal peaked in the USA in 1999 in terms of energy content (but not tonnage, as lower quality coal is being mined). In Pennsylvania, where coal mining started in the USA, coal peaked in 1920. 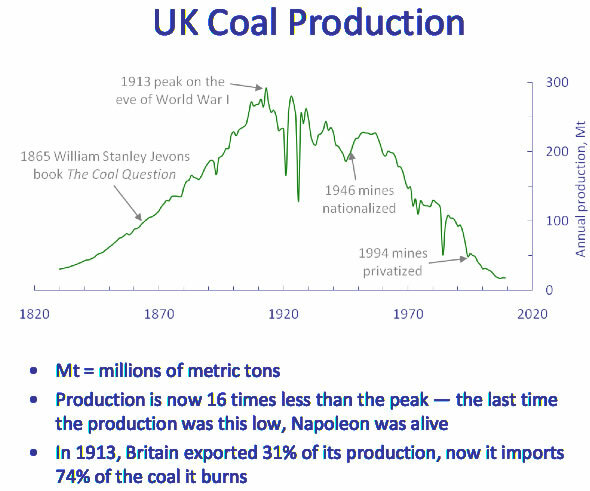 In Britain, coal mining peaked in 1913. Coal peaked in Germany during World War II (when the Nazis used slaves to mine coal). On the downslope of Peak Oil there is the danger that there will be "coal to liquids" industries to create petroleum substitutes from coal. This technology was first used by Nazi Germany during World War II and later by Apartheid South Africa (neither country had easy access to oil to fuel their militaries). Coal to Liquids would accelerate depletion, toxic pollution, greenhouse gases and the devastation of mining. Since we did not reduce coal combustion due to climate concerns, economic contraction after Peak Oil and ultimately depletion will force us to reduce consumption whether we want to or not. We cannot burn fuel that does not exist. "In the US, most experts still rely on decades-old coal reserves assessments that are commonly (though erroneously) interpreted as indicating the nation has a 250-year supply. This reliance on outdated and poorly digested data has lulled energy planners, policy makers, and the general public into a dangerous complacency. In terms of the energy it yields, domestic coal production peaked in the late 1990s (more coal is being mined today in raw tonnage, but the coal is of lower and steadily declining energy content). Recent US Geological Survey assessments of some of the most important mining regions show rapid depletion of accessible reserves. No one doubts that there is still an enormous amount of coal in the US, but the idea that the nation can increase total energy production from coal in the years ahead is highly doubtful." Coal is responsible for about half of the United States electric power grid. Virtually all coal usage goes for electricity -- a small amount is used for metallurgy (iron and steel). Coal mining causes severe ecological problems. Coal combustion is one of the primary causes of climate change. Coal is a primary source for airborne heavy metal pollution and acid rain. Peak Oil and the reduction of availability for liquid fuels from petroleum leads some to suggest that coal consumption should be increased, since there are ways to turn coal into liquid fuels. But this would radically increase rates of coal combustion, increased amounts of coal mining - and more mountaintop removal (a particularly insane form of strip mining that permanently destroys entire regions through deforestation, filling in of streams and rivers, and toxic effluent). Coal is often marketed by its promoters as supposedly having several centuries worth of remaining supplies. If this is true, then the impacts on the atmosphere would become even more severe. But projections about future availability are overstated, since the best coal supplies are largely exhausted and increasing dependence upon coal (to meet ever increasing electrical demand) mean coal supplies are not going to peak sooner than most people realize. Exponential growth and finite resources are incompatible concepts. Since coal destroys ecosystems, poisons the air and water, warms the planet, and is nearing the peak of extraction rates -- shifting away from this fossil fuel is inevitable. Illusions of "clean coal" merely distract from the need to be more efficient in our use of energy, to reduce our greed for energy, and to invest in renewable energy technologies while we still have complex technology and communication systems to use for the transitition. Most of the environmental groups that want to move industrial society "beyond coal" fail to discuss how coal is a majority of electrical generation in the United States and most other parts of the planet. Worse, some of these groups even suggest we should switch some of the coal generation to burn natural gas even though fossil methane (natural gas) has peaked in the United States. The future for natural gas in the U.S. will be toxic shale gas, dangerous Liquid Natural Gas terminals, offshore drilling, coal bed methane and a new natural gas pipeline from Alaska. Renewables hold a lot of promise, but it will not be technically possible to replace all of the fossil fuels with solar panels and wind turbines fast enough. "This order [i.e. capitalism] is now bound to the technical and economic conditions of machine production which today determine the lives of all the individuals who are born into this mechanism, not only those directly concerned with the economic acquisition, with irresistible force. Perhaps it will so determine them until the last ton of fossilized coal is burnt." "I say this based on my experience as the former head of the TVA, which bought and burned more than 30 million tons of coal a year. I was deeply involved in the strip mining, underground mining, trucking, and most importantly, the burning of huge quantities of coal. No one who has been deeply involved with coal can rightfully say it is clean	"
-- S. David Freeman in "Winning Our Energy Independence: An Energy Insider Shows How"
COAL: Cheap and Abundant: Or Is It? Coal-fired power plants provide approximately 50% of the electricity in the United States. It has often been stated that coal is "cheap and abundant" and it is assumed that it will stay that way for at least the next century. A careful analysis of existing information on coal supplies suggests that United States coal supplies are much more constrained than is widely understood. Indeed, it appears that with existing mines playing out over the next 10-20 years and future mine expansions highly uncertain, the planning horizon for building alternative power production infrastructure is likely to be much shorter than previously thought. 1) The U.S. Energy Information Administration has repeatedly published data on coal "reserves" as though they include an assessment of economic recoverability when in actuality they did not. As a result, the often touted "200 year supply of U.S. coal" is not based on a realistic assessment of how much coal will actually be accessible. 2) The United States Geological Survey has developed a tool for assessing economic recoverability and published a series of reports showing that the amount of economically recoverable coal is a small fraction (e.g. less than 20%) of the original resource. The most recent USGS assessment of coal in the Gillette coal field of the Powder River Basin of Wyoming, the source of about 40% of U.S. coal, found that only 6% of the coal was economically accessible under the economic conditions at the time. Between 2002 and 2008, while coal costs were rising dramatically, the USGS reduced the amount of economically accessible coal in the Gillette coal field of the Powder River Basin from 23 billion tons to 10 billion tons. 3) The major mines in the Powder River Basin of Wyoming (e.g. the "Fort Knox" of U.S. coal) have less than a 20 year life span, and coal mines in other parts of the United States are also likely to be playing out in the next 20 years. Future coal mine expansions are highly uncertain as these expansions will face very serious geologic, economic, legal and transportation constraints. Importantly, the federal government owns essentially all of the coal in the western United States, and future coal mineexpansions in western states will have to comply with a host of federal laws. It appears that rather than having a "200 year supply of coal," the United States has a much shorter planning horizon for moving beyond coalfired power plants. Depending on the resolution of geologic, economic, legal and transportation constraints facing future coal mine expansion, the planning horizon for moving beyond coal could be as short as 20-30 years. "We can’t print coal the way we’ve been printing money so we need to take a very sober look at long-term coal supplies and begin to plan accordingly." "Geology and Markets, not EPA, Waging War on Coal"
The EPA is not waging a war on coal. This isn’t to say that a war on coal would be a bad idea, but rather that it’s mostly unnecessary. Coal in the US is dying off on its own, and at most what we’re doing is equivalent to taking it off life support. Our task is to manage the graceful transition to a much lower carbon energy system. The proposed EPA carbon regulations are just the first baby steps we need to take down the path of avoiding catastrophic warming. The EPA, the state legislatures and regulatory bodies, and (someday) the US Congress are all going to have do do a whole lot more work in the years to come, working together to transform our energy system much faster and much more profoundly than these regulations alone can. Because there’s so much more work to do, it is important that we do not allow the EPA and the Obama administration to be made into scapegoats for the decline of the coal industry. We must not allow this kind of work to remain politically poisonous, or we’ll never build the kind of momentum we need to finish the job. "Warning: Faulty Reporting on U.S. Coal Reserves"
"'There's very little low ratio coal out there anymore,' said Al Elser, BLM's assistant district manager for solid minerals in Casper, Wyoming." Powder River Basin coal is some of the cheapest in the world. But as this article shows, the "easy coal" is pretty much gone. That of course means rising prices, and declining net energy. As with oil, coal is not going to literally "run out," but price increases will create an increasing drag on the economy. It's all downhill from here. includes: report on coal peaks for various countries, climate concerns do not include fossil fuel depletion, evolution of world coal estimates, coal mining and burning is concentrated in a few countries, declining energy content and depletion of the good seams, US production on a plateau but Pennsylvania "peaked" in the early 1900s, lots of charts about Peak Coal, Peak Oil, Peak Natural Gas and their relationship to the IPCC climate modeling, potential for Coal-to-Liquids and estimates of coal production for the rest of the 21st century. includes: discussion of "IPCC" models about global warming overestimation of the amount of fossil fuels remaining in ground, highlights Peak Coal in Britain (1913), international survey on major users, downplays impact of fossil carbon but depletion is a real phenomenon that must be included in climate and energy planning. For weeks, South Africa has suffered rolling blackouts caused in part by a shortage of coal. Gripped by unusually bitter snowstorms, China recently banned coal exports for the next two months. And at Newcastle, Australia, the world's largest coal export terminal in the world's largest coal exporting country, the queue of carriers waiting to load has been known to stretch almost to Sydney, 150km to the south. Coal, for so long the Cinderella of fossil fuels, is suddenly not just in demand but in desperately short supply. The world's biggest producers and exporters are struggling, and the price of imports to Europe has doubled to almost $140 (£70.5) per tonne over the past year. "It's a global crunch," says John Howland, managing editor of the international coal industry magazine McCloskey's Coal Report. The immediate reasons for the price spike are soaring demand, inadequate infrastructure and bad weather. But now there are also gnawing doubts that global coal production may, within the next few decades, face fundamental geological constraints, or "peak coal". "Instead of taking the coal out of the mountain, they take the mountain off of the coal." As mountaintop removal increased, the number of coal mining jobs in Appalachia went down as the amount of coal mining went up. Mountaintop removal is a symptom that easier to get coal is approaching inevitable decline. Some of the earliest coal mining areas have scaled back or shut down extraction, since no amount of mining can continue forever. 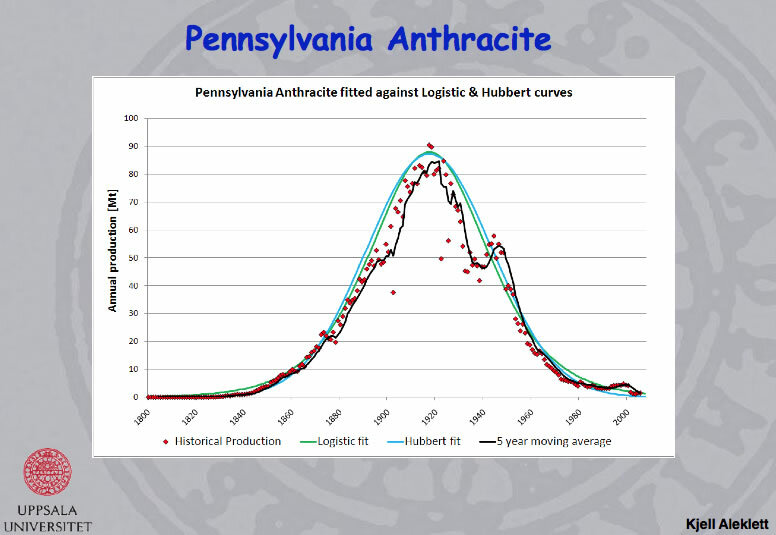 US coal production has mostly plateaued, but extraction in Pennsylvania peaked in the early 1900s. In western Maryland, the Appalachian part of that State, coal mining mostly ended decades ago and now acid mine drainage leaches into the headwaters of the Potomac River (the main river that flows through Washington, D.C.). www.climateaction.net/mjsb (details below) is open to students and others who want to defend the forests and communities of the Appalachians from the devastation of mountaintop removal coal-mining. In mountaintop removal tons of explosives blast entire mountaintops to rubble which is then bulldozed into adjacent streams and river valleys. This highly mechanized process leaves desolate sterile moonscapes and vast toxic slurry impoundments in its wake. Mountaintop removal coal mining is destroying not just the oldest mountains on earth and the most biologically diverse hardwood forests and aquatic ecosystems in the hemisphere, but the mountain culture that has contributed so much to our history and heritage. by Scott Sklar, The Stella Group, Ltd.
matter that has been altered by decay and various amounts of heat and pressure over millions of years. Inter-layered with other sedimentary rocks,...Coal varies widely in its composition. It is composed chiefly of rings of six carbon atoms joined together in an extremely complex composition of layered arrangements that have in them, not only hydrogen but significant amounts of oxygen and nitrogen. The structure also includes varying amounts of sulphur and other environmental pollutants. Up to one tenth of the total mass of coal can be material with no fuel value...Coal is usually analysed for moisture, volatile matter, fixed carbon and ash. The sulphur and nitrogen content are important as emissions of their chemical oxides during coal burning can cause acid rain. Uncontrolled emissions resulted in widespread damage to forests and lakes in Europe, the USA and Canada." Mountaintop removal is a form of strip mining that already covers 800 square miles just in just the eastern USA. A direct consequence of this type of mining is that there have been 6,000 "valley fills" of debris from mountain tops in West Virginia and Kentucky. Since 1980, according to the National Mining Association, only 5% of the destroyed land has been returned to some kind of "economic development" such as wildlife habitat. "Sludge impoundment" is the way that some coal companies deal with the waste that is generated from washing coal. The solid waste (rocks and soil) is used to damn the liquid waste in former valleys. These impoundments have been known to become a source of toxic leaks. Further, dam failure is an historic fact. . . .
Richard Heinberg "Blackout: Coal, Climate and the Last Energy Crisis." An excellent summary of coal's problems from a holistic combination of climate concern, discussion of pollution problems and the inevitable impacts of depletion of this fossil fuel. New forecasts suggest that coal reserves will run out faster than many believe. Energy policies relying on cheap coal have no future, say Richard Heinberg and David Fridley. World energy policy is gripped by a fallacy — the idea that coal is destined to stay cheap for decades to come. This assumption supports investment in 'clean-coal' technology and trumps serious efforts to increase energy conservation and develop alternative energy sources. Today's edition of the highly-esteemed Nature Journal contains an analysis of global coal supplies by Post Carbon Institute Fellows David Fridley and Richard Heinberg. If you're a subscriber to Nature, you can access the article here. If not, Nature's podcast interview with Richard Heinberg provides an overview. And here's a nuanced take on the issue from Ars Technica. And one from Business Spectator. The idea that coal is cheap and plentiful drives much thinking about future world energy consumption. It can explain the resistance of the United States and China to carbon-cutting policies — both countries have lots of coal, and they don’t plan to stop using it anytime soon. But is it a reasonable assumption? Richard Heinberg and David Fridley argue in this week’s Nature that coal prices are likely to start rising much sooner than everyone thinks — perhaps by the end of this decade. This prediction is based on two observations. First, several recent studies suggest that high-quality accessible coal reserves will run out much sooner than predicted by official forecasts from the main coal-producing countries. Second, global demand is growing rapidly, mainly driven by China. China is both the world’s biggest producer of coal and its biggest consumer. “Its influence on future coal prices should not be underestimated,” say the authors. The authors call for better data on world coal supplies. A US national coal survey was last completed in the 1970s and is long overdue. Countries should also immediately start planning for higher coal prices, and reconsider their investments in clean-coal technology. If coal becomes more expensive, then carbon capture and storage will no be longer be an economically viable route to reducing carbon emissions. The economic shocks from rising prices would be felt by every sector of society, say Heinberg and Fridley. New limits on energy consumption “will be imposed by energy prices and shortages if they are not achieved though planning and policy”. A soon-to-be-released study by the Energy Watch Group in Germany on the future of global coal supplies has implications so surprising and far-reaching that energy policymakers may take years to digest it. This essay is intended to help speed that process. The report’s central conclusions are that minable global coal reserves are much smaller than is commonly thought, and that a peak in world coal production is likely within only ten to fifteen years. But-most of the time, of course, we should prefer to forget that they were doing it. It is so with all types of manual work; it keeps us alive, and we are oblivious of its existence. More than anyone else, perhaps, the miner can stand as the type of the manual worker, not only because his work is so exaggeratedly awful, but also because it is so vitally necessary and yet so remote from our experience, so invisible, as it were, that we are capable of forgetting it as we forget the blood in our veins. In a way it is even humiliating to watch coal-miners working. It raises in you a momentary doubt about your own status as an 'intellectual' and a superior person generally. For it is brought home to you, at least while you are watching, that it is only because miners sweat their guts out that superior persons can remain superior. You and I and the editor of the Times Lit. Supp., and the poets and the Archbishop of Canterbury and Comrade X, author of Marxism for Infants--all of us really owe the comparative decency of our lives to poor drudges underground, blackened to the eyes, with their throats full of coal dust, driving their shovels forward with arms and belly muscles of steel.